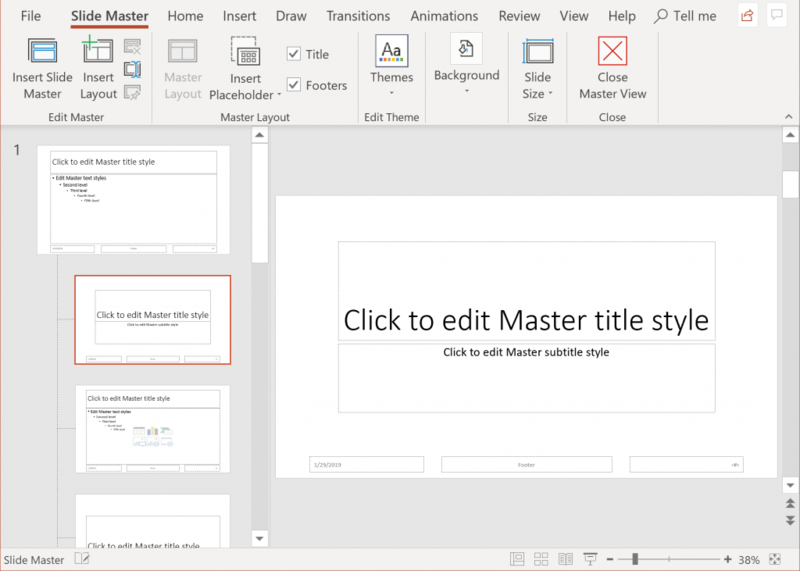 Microsoft PowerPoint is commonly used to create slide show presentations to convey information in a visual format that can include a combination of text, tables, images, charts, and graphics. For users of assistive technology, screen readers and Braille devices can convey content in a PowerPoint presentation if the author follows the core principles outlined in the Overview of Accessible Documents. The following information includes basic steps for applying these core accessibility principles and for keeping accessibility in mind. Built-in slide layout templates are designed so the reading order is the same for people with vision and for people who use assistive technology such as screen readers. They also contain all the formatting, such as theme colors, fonts, and effects. Theme layouts should be adjusted in the Slide Master to maintain accessible formatting for screen reader users. 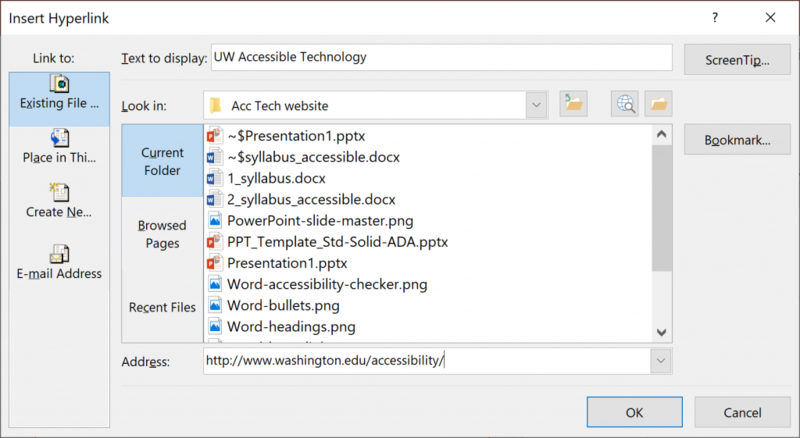 For those who use University of Washington branded PowerPoint templates, users can download the most recent versions that include accessible layout. Avoid using Text Boxes as they do not show up in Outline View which makes converting PowerPoint to HTML problematic. If there are more than one Text Box on a slide it may be read out of order by a screen reader. Use a pre-set layout from the New Slide drop-down selection options, select the layout that best fits your needs. Individuals who use a screen reader skim slide titles to navigate, they can quickly scan through a list of slide titles and go right to the slide they want. Using unique slide titles allows them to clearly understand which slide they are on. Avoid using the same title for slides that have spill-over information, consider including additional information such as ‘Slide Title 1 of 2’. Screen reader users sometimes scan a list of links. Links should provide a clear and accurate description of the link destination. Rather than providing the URL of the link, consider creating a hyperlink with text to describe it. To keep track of their location in a table, screen readers count table cells and use header information to identify rows and columns. If a table is overly complex, the screen reader loses count and can’t provide useful information about the table. Blank cells in a table could also mislead someone using a screen reader into thinking that there is nothing more in the table. Screen readers read the elements of a slide in the order they were added to the slide, which might be very different from the order in which things appear. To make sure everyone reads the contents in the order you intend, it’s important to check the reading order by using the Selection Pane. From here, you can drag and drop to adjust the reading order of the contents on the slide. NOTE: The reading order in the Selection Pane should be arranged from the bottom up. The title should be at the very bottom with subsequent content following it. For screen reader users, alternative text helps to communicate what is important in images and other visuals. Alt text provides a textual alternative to non-text content. Microsoft products have a built-in accessibility checker which can help the document author test the overall accessibility of the document. The checker provides Inspection Results, feedback about the importance of each item, and tips on how to repair issues. If all of the steps were followed to create an accessible PowerPoint presentation, exporting to PDF properly will ensure heading structure and other accessibility information will remain intact. Users of PowerPoint for Mac should be cautioned that exporting to PDF will not yield an accessible, tagged PDF document, it must be remediated using Acrobat Pro. 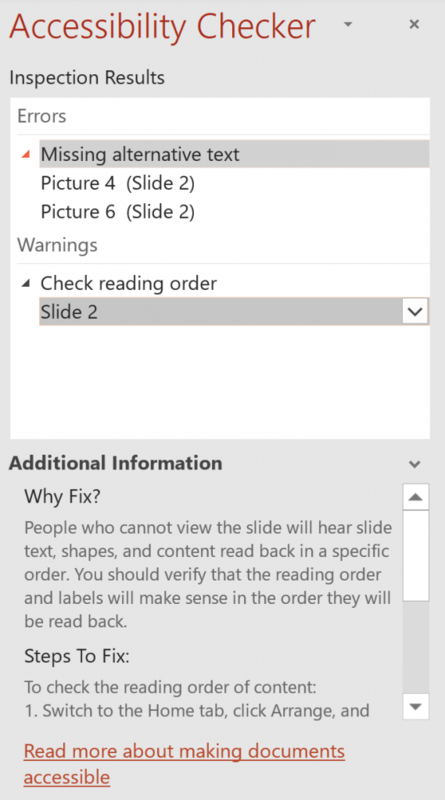 For more detailed information on how to create accessible PowerPoint presentations, visit the Microsoft Accessibility Support website, or view WebAIM’s article on PowerPoint Accessibility.